Indian Navy Recruitment 2018-19 – Apply through Online for 37 vacancies of SSC Officers posts: Indian Navy recently released a job notification on its official website indiannavy.nic.in for SSC Officers posts. Candidates are allowed to apply for Indian Navy Recruitment 2018 from 15.09.2018 to 05.10.2018. Candidate can find the further details like Eligibility Criteria, Age limit, the Selection process of Indian Navy Recruitment 2018 on the below page. 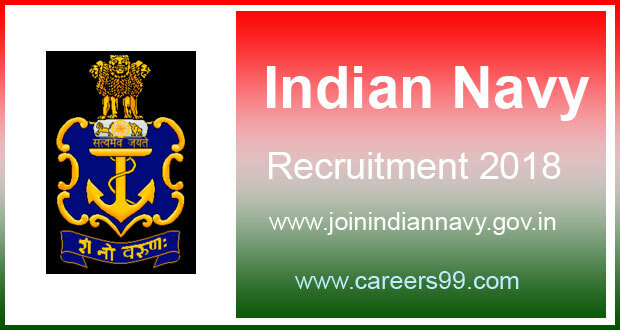 Job Seekers can apply for the post through the Official page indiannavy.nic.in and careers99.com. Indian Navy Notification 2018 announced for the vacancies of 37 SSC Officers on its official website indiannavy.nic.in. Eligibility criteria, Educational Qualifications, Age limit, Selection process, Pay scale and other required details are mentioned below in careers99.com. So candidates who are interested and eligible can apply Online before the last date of the Notification i.e., 05.10.2018. SSC (Logistics): Applicants who have completed BE/ B.Tech in any discipline with First Class or MBA with First Class or B.Sc / B.Com / B.Sc (IT) with first class with a PG Diploma in Finance / Logistics / Supply Chain 60% Management / Material Management or MCA / M.Sc (IT) with First Class or B.Architecture with First Class or equivalent from a recognized Institute for Indian Navy Recruitment 2018. SSCX (IT): Applicants who have completed BE/B.Tech (Computer Science/ Computer Engg/ IT), M.Sc (Computer / IT). B.Sc (IT). M.Tech (Computer Science). BCA / MCA or equivalent from a recognized Institute for Indian Navy Recruitment 2018. SSC (Law): Applicants who have completed Degree in Law qualifying for enrolment or equivalent from a recognized Institute for Indian Navy Recruitment 2018. Selected candidates will get Rs.56,100 – Rs.2,12,400/- by the Recruiting Organization.